Yumcha At The Golden Dragon is an event that took place on 27-May-2007 in Hyderabad. 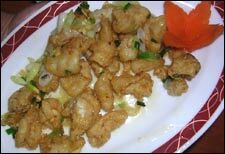 If you are in the mood for a fabulous Chinese brunch ...you should perhaps look for a place less expensive. If money is no object, however, here's the space and the time. Golden Dragon, the speciality Chinese restaurant of the Taj Krishna, is organizing a Chinese Brunch, Yumcha, every Sunday. The buffet contains a 11-course Chinese menu, with unlimited beer and iced tea. This brunch will include a variety of soups and Chinese dishes including Dimsums, Kung Pao Chicken, Garlic Chicken, Pan-Fried Chicken, Steamed Chicken or Fish Bao, Steamed Vegetable Bao, Sweet And Sour Soups, Fish Mao Soup, Sweet Corn Soup, Wontons, Manchurians, and a variety of noodles. In salads, there are Fruity Chinese Cabbage Salad, Shangai Chicken Salad, Tomato & Cucumber Salad, Oriental Chicken Salad and many more. The buffet is priced at Rs. 555 + taxes. For further details, please contact the restaurant at 6666-2323. Be the first to comment on Yumcha At The Golden Dragon! Just use the simple form below. fullhyd.com has 700,000+ monthly visits. Tell Hyderabad what you feel about Yumcha At The Golden Dragon!